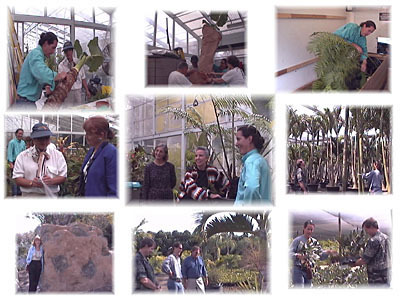 George Bailey, owner of Green Affairs, was the official plant coordinator when Fairchild Tropical Botanic Garden debuted at the world famous Chelsea Flower Show in May 2000. George's previous experience with the logistics of packing and shipping plants to international destinations made him the natural choice. He and Fairchild's conservatory manager, Craig M. Allen, selected palms, aroids, alocasias and a wide variety of tropical plants for the display. The 28 foot by 34 foot display garden was assembled in a few short days prior to the gala opening attended by the queen and the royal family. More than 170,000 people attended the four-day gardening show.